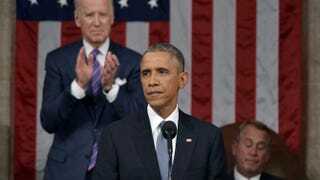 President Barack Obama delivers the State of the Union address as Vice President Joe Biden applauds Jan. 20, 2015, in the House chamber of the U.S. Capitol in Washington, D.C. While the rest of you were playing State of the Union drinking games (taking a shot every time Speaker of the House John Boehner grimaced, eh? ), we over here at The Root were hunkered down, scouring over every word the president spoke to get an understanding of what issues he wanted to zero in on. The most talked-about issue was the economy; Obama referenced it about 30 times. Communicating his successes has been an area that even he noted could be improved, so he made sure to bask in all of his economic achievements, which included turning around the economy, stopping the recession, creating jobs and lowering the unemployment rate. He championed the “middle-class economics” strategy he used to achieve these goals several times throughout the speech. The ongoing #BlackLivesMatter movement against excessive police force used in African-American communities, and how racial bias rears its head in criminal law enforcement, was noted only a fraction of times, coming in at a dismal six mentions. Obama used a kumbaya theme to talk about how Americans have a lot in common and that we should concentrate on those areas where we agree in order to sort out racial issues. Obama uttered the word “Ferguson” once, made a reference to the Eric Garner killing in New York City once, and spoke about how his growing up in the multiethnic melting pot that is Hawaii allowed him to see that we’re all more alike than different. Other notable mentions: Talk about investing in education, job-training programs and preparing students for the industries that will be hiring the most in the near future came up roughly 14 times. Obama spoke passionately about family values and increasing and fortifying workplace benefits like paid sick leave, maternity leave and increasing access to high-quality, affordable child care. Putting a microscope over the expenses that working-class and middle-class families have, and seeking to reduce those costs, came up about 17 times. After that, the fight against Islamist terrorism and ending the wars in Afghanistan came up about eight times each. Access to quality health care and Obama’s marquee health care act: roughly seven times. Climate change, about five times. Obama hat-tipped veterans and encouraged employers to hire them because of their work ethic about six times. Reducing our dependence on foreign oil and strengthening our auto, wind-power, solar-power and energy industries came up about nine times. According to some reports, Obama was the first U.S. president to make mention of the hardships experienced by the bisexual and transgender communities during a State of the Union speech. He rattled off a number of policy decisions that were positives for him. Each of them earned one tick: Cuba; the U.S. emerging more politically and economically stable than Russia; moving the ball on cybersecurity and stressing to students just how much of a player these kinds of careers are going to be in the future; helping Africa with Ebola; and his executive actions on immigration. “I have no more campaigns to run,” he said, to which several Republicans cheered. Bloop. That left an indelible mark on the collective memory of speech observers. In all, the scoreboard reads: Obama: 1. GOP: 0.